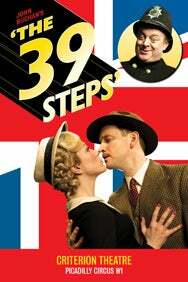 We do not curently have theatre tickets available for The 39 Steps. This could be because we have simply sold out or it could be that this show is no longer running. The information on this page remains purely for historical and informational purposes. Hitchcock meets hilarious in this madcap stage adaptation of the classic movie by the Master of Suspense. John Buchan’s gripping whodunnit - memorably filmed by Hitchcock in 1935 - has at last been thrillingly adapted for the stage by Patrick Barlow. This astonishing theatrical tour-de-force is performed by just four actors essaying 139 roles, but nothing has been cut from this spectacularly silly, side-splitting version of Britain's most spellbinding thriller. Legendary scenes include the chase on the Flying Scotsman, the escape on the Forth Bridge, the first theatrical bi-plane crash ever staged and the death-defying finale at the London Palladium. Seats in the rear stalls with a face value of £25 are classed as restricted view.